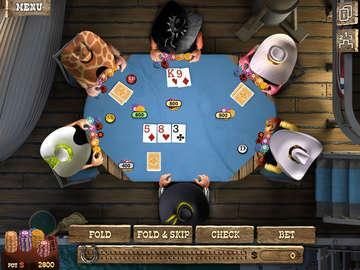 Show your Hold'em skills in the all-new Governor of Poker 2 Premium Edition, a masterful poker adventure set in the Wild West! The Texas Gambling Committee has outlawed poker throughout the state. As the titled Governor of Poker, it's up to you to fight for your right to play cards and convince the government that there can be no Texas without its favorite game. Are you up to the challenge? 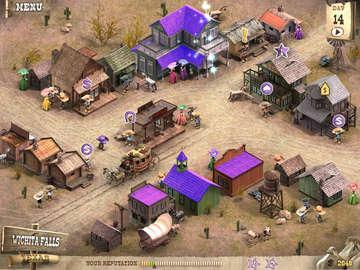 Get on the train to Amarillo and show them what you've got with your own customizable character! Travel by train as you visit all-new cities to take on gamblers, gunslingers, and other notorious players, each with their own unique tell to give you an advantage. Enter poker tournaments or create your very own to win big and purchase land, homes, and places of business. It's a tough job making Poker legal once again, but somebody has to do it, and as the Governor of Poker, it's all on you! 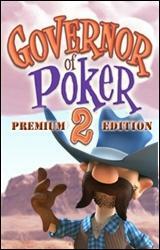 Play Governor of Poker 2 Premium Edition free with the demo version or download the full version today! Poker games are definitely one of the most contagious card games there are, and imagine that you are a poker addict and you live in Texas Wild West time where not even women could interfere with an old fashioned Texas Hold’Em Poker hand. This game is the tradition of the state as the name says for itself, but what would happened if the game was suppose to be banned from playing in that same state??? The Governor of Texas declared the game as banned because it is a pure luck game without any use in the community. As the Governor of poker you go on a mission to persuade the governor that poker isn’t about luck at all, rather than it is a game which requires a great amount of skill especially in the area of perception, memory and strategy. You start convincing the Governor with every game won and traveling around the Texas in the search for worthy opponents that will challenge you or you will challenge them! You will be traveling around with a stagecoach, a riverboat or a train which will be used the most. Through the game you’ll be doing a lot of gambling at the poker tables trying to earn cash and fulfill expectations of the governor of Texas. All the games are in Texas Hold’Em poker style, and the process has been streamlined to make things as easy to understand as possible. There's a fairly in-depth and very helpful tutorial that explains the ins and outs of the game, so those new to poker can learn how it's played before diving in, but in between content isn’t bad at all too. When you are not at the tables, you are running from town to town buying property, which gives you a small income amount which adds up to your wallet. The difficulty of the poker games isn’t meant for the professionals as it is more intended for the common people of average knowledge of poker games or for those who don’t know the rules. Like previously said there is a nice tutorial to explain the basic rules of game. Also when you’re in the town there are nice accessories for your avatar to buy. As the players faces are impossible to see, they wear huge hats in different styles and colors which can be all bought in the hat store. Even if they have almost anything with the game play, if you have some extra money it is a nice touch to the player outfit. But if you got caught in money crises you have a couple of options to gain some money. One of those options is the bank lone which you can get based on your property or you can sell your property completely. To make sure this never happens you have to watch out when playing a hand for your opponent’s reactions or ticks. Like in real life every man has a tell when holding good cards or bluffing, and this also goes for the game, as the players that are computer controlled have those ticks too. Watch for those ticks and you’ll have always at least small advantage on them. 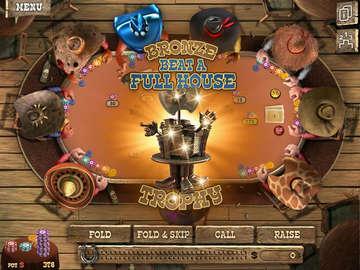 There are two play modes or play challenges: cash games and organized tournaments. You can play one each day, provided you have enough cash to buy-in, and the two feature a number of important differences. The cash games are typical all in games, as you can, besides money, cash in your property in the pot and in this game the only winner is the one who wins the first place, and the rest get nothing. In the tournament mode, the first three places get cash rewards but the first place grabs the biggest bite. The animations look great, as you'll see characters do everything from flipping chips into the air to banging their fists on the table. The nice graphical additions are great for the game play and surely won’t disappoint you. As the game itself as addictive by itself you’ll find a lot of pleasure in this game and well spent time in fun.